Several people living on the streets of Rome or in tents say it is not difficult to find a parish or charity that will give them something to eat, but finding a place to wash is much more difficult. “It is not simple. It is easier to prepare sandwiches than to run a shower service,” said Archbishop Konrad Krajewski, the papal almoner. The news site Vatican Insider first reported the news that Archbishop Krajewski had asked the office governing Vatican City State to include showers in an already-approved project to remodel the public restrooms in St. Peter’s Square. The remodeling work and installation of the showers was scheduled to begin Nov. 17. The archbishop said the three shower stalls would be located in the public restrooms a few steps north of Bernini’s Colonnade, just behind the Vatican post office. The archbishop told Vatican Insider that in early October he was talking to a homeless man near the Vatican and discovered it was the man’s 50th birthday. He invited the man to a restaurant for dinner, but the man declined, saying a restaurant would not let him in because of his odor. Sitting on the steps of the Vatican press office Nov. 13, Barbara and Stefano were discussing the plans with a small group of Polish friends — and expressing some doubts about it to reporters. In addition, she said, because the number of homeless men is so much greater than the number of homeless women, many of the shower facilities are only for men or are open to women only a half day each week. 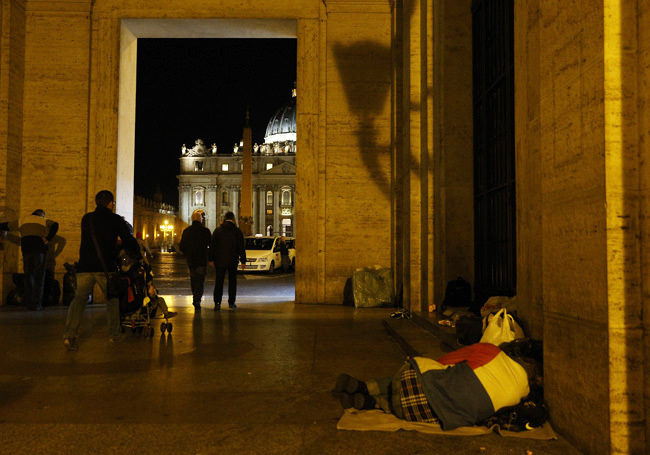 Archbishop Krajewski told Vatican Insider that he is visiting parishes in areas where homeless people gather and is encouraging them to install public showers if they have not already. His office will help fund the building, he said.